All of your questing and dungeon plundering days are behind you – but that doesn’t mean your stories of hardships and triumphs need be forgotten! By filling this journal with your memories you will allow some of your greatest feats… and failures… to live on. You do remember how your life story went… don’t you? Best described as a hybrid of choice-based interactive fiction, a deck-building card game, and a solitaire table-top roleplaying session. You’ll make important story decisions, roll dice to test your abilities, collect weapons, magic, and companions to be used in a card game that will reveal the outcome of your most devastating encounters! 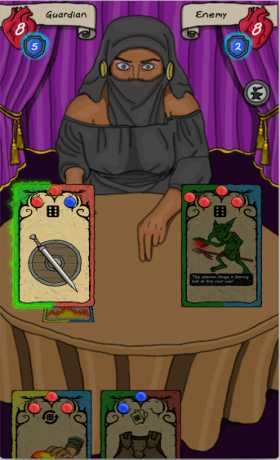 + Card-Battle System: Use the magic, weapons, and companions gathered through the story to defeat powerful foes. Perhaps you’ll squash that giant spider with your war hammer or perhaps it’s a better idea to blast it from afar with a fireball? Your choice, your strategy! 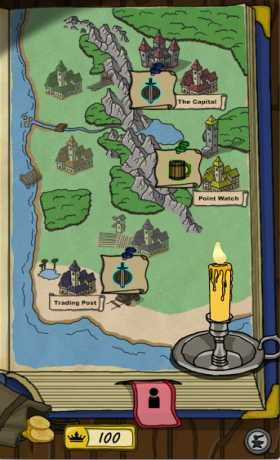 + Dynamic Short-Stories: Adventure on an interactive map with random events. Each event is a short-story that will put your strength, dexterity, intelligence, and charisma to the test! 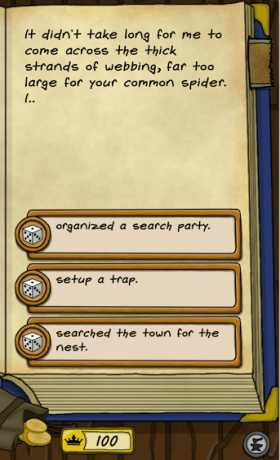 Careful, as each short-story can escalate if left unattended and eventually will consume the towns you are meant to protect. + Life Chronicle: In Heroes Guard you are a old, weathered adventurer recalling all his past feats. Perhaps you rose to power as a commander in the guard, or perhaps you lost it all and ended up as a beggar on the streets?